A good set of kitchen knives is something for even the tiniest of kitchens or the most infrequent of cooks. You will be amazed by how much faster and easier food preparation becomes when you have the help of some great kitchen knives. The best kitchen knives will last a long time, even a lifetime, so it’s a worthy investment. 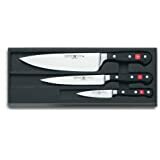 There are many different kitchen knife sets on the market and each set contains a knives of a variety of shapes and sizes. Some are purpose-made; suitable for one particular job. Others are multi-use capable of completing a number of food prep tasks. Browse through our site, read the reviews, the buyer guides, and get the best knife or knife set to cook with. The following interactive table and the analysis below it will help you make an informed buying decision and what the best set of knives for you is. Rating – The average user rating from Amazon UK reviews. This gives a good indication of how satisfied people are with their purchase. Kitchen knives are essential tools intended for the preparation of food in the kitchen be it carving meat, chopping vegetables, or just slicing a sandwich in half. They come in many different shapes and sizes that are much sharper than a table knife and often specially designed for specific food preparation tasks. Some knives are purpose made but with just a few you can cope with most tasks. The modern chef’s knife, also known as the Cook’s Knife or French Knife, was originally designed to slice and disjoint large cuts of beef. The modern chef’s knife is multi-purpose. It’s long curved blade means it is a good performer across many different kitchen tasks. It can be used for slicing meat, chopping vegetables, and disjointing large cuts. It’s most often used for large scale chopping. The curved design allows the knife user to rock the broad and heavy blade on the cutting board for a precise cut. This features also make it good at chopping bone when a cleaver is not available. Chef’s knives are available between 15cm – 30cm (6” – 12”) and are usually about 3-4cm (1.5”) wide with a typical edge angle of 20-22°. The most common size is 20cm (8”). There are two different blade styles for a chef’s knife; German and French. Neither is inherently superior, it is all personal preference. The German style blade has a deeper and more continuous curve running along the cutting edge whereas the French style has a straighter edge and then a curved tip. The paring knife is one of the most frequently utilised knife in a chef’s kitchen. They are extremely versatile and can be used in a variety of ways for the preparation of small vegetables and fruits. Apart from chopping and peeling they can be used for picking out pips and eyes due to the sharp pointed end as well as intricate work such as de-veining a shrimp or cutting small garnishes. They are an all purpose small utility knife with a 6cm – 10cm (2½” – 4″). They are basically just a smaller version of the chef’s knife. In terms of size the utility knife fits between the paring knife and the chef’s knife at approximately 10cm – 18cm (4″ – 7″) long. It is a general purpose knife that can have a plain or serrated edge making it good for cutting larger vegetables and sandwich meats and other miscellaneous chopping tasks. However it does not really offer anything that a good chef’s knife and a good paring knife cannot handle. Compared to a chef’s knife it has insufficient clearance when used at the chopping board and is too fragile for heavy duty cutting tasks. In comparison to a paring knife it is much harder to use between the hands, and the added length just makes it harder to control. For this reason the utility knife is not very popular and is derided as filler in knife sets. Bread knives are the first specialised knife we are going to talk about. The rigid thick blade is usually between 15 cm and 25 cm (6″ and 10″) but what makes it different to the chef’s knife is the serrated or scalloped edges. Some designs use a combination of the two. This feature makes it ideal to cut through the hard crust on a loaf of bread without tearing or crushing the delicate soft centre. These attributes also make it good with tomatoes! The carving knife is a large knife of about 20cm – 38cm (8″ – 15″) with a thin flexible blade and a tip that is sharply pointed. It is used to thinly slice cuts of meat like poultry, roasts, hams, and other large cooked meats. It is thinner than a chef’s knife, especially at the spine, which enables the carving of thinner more precise slices of meat, however this means that chopping can damage the knife so use a sawing motion instead. Carving knifes can come with a plain or serrated edge. A carving knife was once used by a farmer’s wife to cut off the tails of three blind mice. The boning knife is a specialised kitchen knife used for removing bones from raw poultry, meat, and fish. It is not as thick as other knives and has a narrow blade with a sharp point to get to small places. The thin flexible blade is usually about 12cm – 15cm (5″ or 6″) long. Stiffer boning knives are preferable for use on beef and pork whereas a flexible knife works much better on poultry and fish. A large rectangular-shaped thick heavy bladed knife with a slightly curved edge used to chop meat and to sever and prepare joints. It is designed to cut with a swift stroke without cracking, splintering, or bending the blade. The cleaver most often found in the home knife set is a light-duty cleaver about 15cm (6”) long. Filet knives are thinner more flexible boning knives especially designed to fillet and prepare fish. They move easily along the backbone under the skin of a fish with their blades of about 15cm – 28cm (5” – 6”) long. The slicing knife is a longer and narrower version of the carving knife. Its edge can be be plain or serrated and its tip can be blunted or rounded. It is more flexible so is best used to precisely cut smaller thinner slices of meat. It is better suited to slicing ham, roasts, and fish. A ham slicer is a slicing knife specialised for ham. It is even more thinner and flexible. How to find a knife set that meets your needs? Use the interactive comparison table above to compare many of the top kitchen knife sets available today. Make sure to read this site thoroughly and take in all the options and criteria so that you make an informed buying decision. Above you will find the The Best Kitchen Knives Comparison Guide to help you find the perfect kitchen knives for you and your kitchen. 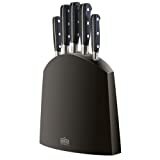 Most of the kitchen knife sets included above are fantastic choices, but we do have some favourites. So you’re looking for a decent set of kitchen knives eh? No, not just decent, you want the best kitchen knives without taking out a second mortgage or getting any nasty surprises upon delivery. Well on this site we do our best to give comprehensive knife reviews to make your life easier – if you need to get the facts even faster though to choose which kitchen knife reviews to read, here’s a summary of the top six. 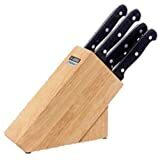 With a reputation like Jamie’s, you immediately know you’re going to get great quality and the Jamie Oliver Professional Quality Knife Block set is definitely that. 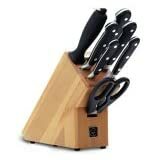 It contains five essential kitchen knives in a sleek wooden block and the style easily suits any type of kitchen. These knives are durable with a full-tang and flawlessly constructed stainless steel blades – You’ll find yourself still using this set decades down the line. With the name of each knife engraved on its handle, it won’t take more than a second to locate the knife you want and this is a pretty rare attribute in a knife set. Wonderfully and ergonomically shaped, these are knives for a professional or a keen domestic chef who appreciates quality. Not only will this set meet all your needs, it also won’t break the bank and will give you value for money for years to come. This set isn’t a celebrity endorsement; it’s a collaboration between Jamie Oliver and the Swiss Deithelm Keller Brands. This is one set in a whole Jamie Oliver range of quality kitchen equipment, giving you a lot of room to expand your Jamie-themed kitchen. C’mon, you can’t deny that he’s a man who knows the best of the best. For an in-depth analysis and knife specifications, head to the full review. Global Knives have gone out of their way to make some of the world’s best kitchen knives in true Japanese style and quality for decades; they produce knife sets that are diligently designed and crafted from a unique stainless steel. 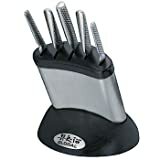 This Z-line block set comprises of five practical knives that no chef can be without and is suited to ambitious home chefs and even professionals. If it’s affordable you’re after then this set probably won’t sit well with you as they’re unmistakable quality but have a price that makes them an investment, not a spontaneous purchase. If you’re open to spending some serious money on a seriously fantastic set of knives though, then keep reading. Sitting in an ultra-modern block, this set looks sleek and almost futuristic with their intriguingly shaped handles and single piece construction. Not the most forgiving on the hands if used for hours on end, these Global Knives will nevertheless be found in professional kitchens all over the world and you’ll find them perfectly balanced with an acutely angled blade for added longevity. If professional quality is what you’re after and you’re willing to really pay for it, then continue to the full-review for more details and information. Another set from Global Knives because this brand really do know exactly what they’re doing. This beautiful set are five of the best kitchen knives from different Global ranges; brought together to form a very practical set. It’s easy to forget what good knives should feel like when you’ve had a sub-standard set for years but the second you start to use these, you’ll notice the quality and the difference they make to your cooking. Designed at professional level, these knives will make the amateur chef better, the ambitious chef experimental and the professional chef happy. They are designed to stay sharp for a considerably long time and if you treat them well, you should never need to buy another knife set again. Not the cheapest set available, the cost will be a one off payment for a set of worthy knives that you may even pass down to your children. The block for these is not, in our opinion, the most attractive of knife blocks but it definitely does the job in a space efficient manner and matches the monochromatic look of the knives. The fantastic reputation of knife making in Japan has kept Global on its toes and they have yet to make a single knife that would let the side down. Head to the full review to really make up your mind about this set and we don’t think you’ll be disappointed. This knife block set is from a company that has been in the business for almost two hundred years and they remain as dedicated to the creation of kitchen knives as ever. This Sabatier 9-piece set isn’t for the unenthusiastic cook, it’s professional quality and comprehensive in its use, ideal for the pro, the trainee or the dedicated domestic cook. With nine knives to this set you ideally want to be sure to use them all at least sometimes otherwise you’ll have a set that’s just too varied for your uses. 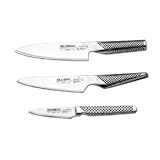 Including more specialist items such as a boning knife, a carving knife and a carving fork, this set is perfect for the accomplished and diverse chef. With a triple riveted handle and a smooth construction, these knives feel every inch the quality they are and they’ll stay sharp for a very long time. When the time comes to sharpen them, you’ll find a matching sharpening steel in the knife block too. Much more affordable than the Global ranges, Richardson Sheffield offer undeniable quality combined with traditional style for a knife set that is a pleasure to use. 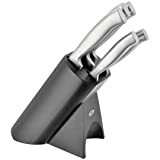 If you’re looking for a varied and comprehensive knife set for all manner of cooking then head to the full review for this set to make up your mind. Like Richardson Sheffield, Taylor’s Eye Witness knives have been around for almost two hundred years and they are still up there in the market leaders. This set will appeal to those who enjoy quality and vibrancy in their kitchen but don’t need professional quality or a varied range. Instead, this brightly coloured set offers five essential kitchen knives with a fun, aesthetic appeal. The knife block is a unique style that shows off the colour of the knives as well as being adjustable in shape. 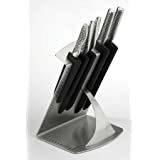 Fan the knives out for a modern display or line them up to save space – this is one of the few blocks out there with such an innovative design. For those who want to add colours and modernity to their kitchen, this set is the way forward. Although professional quality knives are nice, not everyone wants or needs to shell out the cost of them and so it’s to high quality domestic kitchen knives that we must look. You don’t have to compromise anything though because Taylor still makes these strong, durable and very sharp. 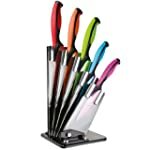 Take a look at the full review for more details and get a colourful knife set to liven up the kitchen and inspire you to get those cookbooks out. Another colourful set to inject that vibrancy into your kitchen, this knife block set contains the five knives you’ll find yourself needing the most. Forged from a single piece of steel, they are strong and sleek with a fine, minimalist touch. This set is ideal for the day-to-day home cook who doesn’t need to fork out for professional quality but likes a knife to do its job very well. The Accents range not only comes in a wide choice of colours, it has the added benefit of containing a vast quantity of colour related kitchenware, giving you the opportunity to have a matching kitchen. As a result, this knife block is a perfect gift for someone starting a home as it gives them the flexibility to add to their collection. Very affordable without compromising quality, Morphy Richards have created a simple and effective knife range that is easy to clean and look after. Nicely weighted with a tangible strength, these knives will see you through the majority of your cooking with no trouble at all. For more information and more detailed knife specification, go to the full review on this site. We have given you our top picks for the best kitchen knives on the market. Now it is up to you to pick what meets your needs and fits your budget to help equip your kitchen and make cooking much more pleasurable experience. New knives are being introduced to the market all the time though. We will update the comparison chart as new knives and knife sets are introduced that need to be added to the list. If you feel like we have missed a superior set that needs to be included then get in touch with your best kitchen knives.